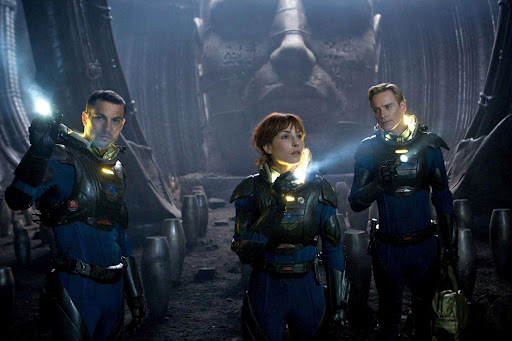 Before seeing Prometheus, I was bombarded by mini-reviews from Facebook and Twitter friends saying, “meh,” and I have to say, I think this film is better than mediocre. Perhaps everyone set my expectations low, but I thought it was enjoyable and engaging. Having said that, it definitely has its problems. I love the way the film looks, and it’s fun being transported to an Alien-like realm that’s also new and interesting. It has a satisfyingly creepy, eerie design and feel that kept me at attention, waiting for something to lurk from the shadows, and I wasn’t disappointed. There are a few scenes that genuinely disturbed me in the best way possible, and I found myself clutching my seat with vigor. Oddly, this film also has some horrifying motifs that echo female anatomical parts, possibly created by someone with Mommy issues. Aside from the awesome atmosphere, the characters themselves were big hits and big misses, but I thought the main characters were spot-on. The eerieness of the film was contributed to in no small part by Michael Fassbender’s robot character, Michael. Win. Also, I loved the main female character Elizabeth Shaw (played by Noomi Rapace) who brings some serious badassery. And for all you feminists, I liked that this actress rocks some curves– and yes, between Rapace and Theron, this film does indeed pass the Bechdel Test. Besides the characters I liked, there were a few scientists in the mix that proved ridiculously incompetent, but I forgave them for the characters that were cool. Overall, I like that this film leaves things open-ended and doesn’t explain too much. However, awkwardly amongst the obscurity, there are a few scenes that painstakingly over-explain the obvious, and those are the parts where I face-palmed. For me, the good outweighs the not-so-good, and I think this beautiful film (yes, I use that word in conjunction with an alien-horror film) deserves a watch. I think the movie definitely stands on its own.. there is no need to have seen any of the other films here and in fact I think some of us that had seen the original Alien movies walked in with certain expectations that would not be met. If you expect an Alien prequel you will not be fulfilled.. If you expect non stop suspense on the same level as the original Alien this movie will not deliver.. But as a movie trying to tell a story, launch a new branch of an established mythos and be scary every once and a while I think it does very well and as you said is beautiful while all of that is going on.